It has been a long time since i have been extremely captivated by a novel so it is with joy that I reveal before I get to talking about the pedigree of this book, that it is a wondrous thing indeed and worth your purchase and perusal. Erin Morgenstern has crafted that rare avis, a debut novel that is so fully realized that it is hard not to think of it as the work of an established professional. If you want to go into this novel with no knowledge other than my heartiest recommendation, stop reading this now, I implore you, for what I may say below might take away some small bit of that wonder and surprise that I was allowed to enjoy, as I received this book as an advance reader's edition, with nothing other than a small publisher's blurb and an editor's invite to discover it for myself. I suspect that it won't be too many more weeks or months before this book and likely movie version is more well known. 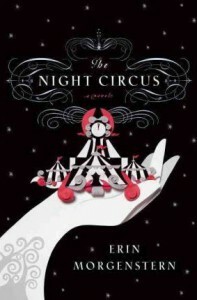 The Night Circus sits atop a mound of other books that have similar themes and plot devices, much like that comment by Newton that scientists have been able to reach great heights because they have been fortunate enough to stand on the shoulders of the scientific genius that went before them. While not as directly as Lev Grossman did in The Magicians, Morgenstern's novel reminds me of so many other good work, while at the same time never becoming less by doing so. For example, the concept of a magical duel over the ages recalls Christopher Priest's award-winning The Prestige, while the wonderful descriptions of illusion after illusion reminded me of Carter Beats the Devil by Glen David Gold, while the scenic background of the circus brought to mind both Angela Carter's byzantine Nights at the Circus as well as the more recent Like Water for Elephants (a story which I have only seen in film adaptation, albeit quite recently, which may be while it springs to mind). And while it isn't as densely intricate as the lush romance in A.S. Byatt's Possession, there is a love story herein with true feeling and power. I hesitate to describe too much of the plot itself, which in this case would be akin to revealing how the magic trick is accomplished, but I do want the reader to be aware that this is a fantasy--but then, to steal a line from Alan Moore, aren't they all? Some people, however, are wary of magic, whether depicted as unreal or as a part of the fabric of everyday life, and while I pity them, I dislike to mislead. The central conflict between the two magicians, though, is conveyed in its own wrapping of written enchantment, that one could almost ignore the fantastical, if only to call it dreamlike. What I particularly liked about what Morgenstern has accomplished here is how she is able to capture the amazement of life as seen through the childlike wonder we attribute to the circus, and still keep to a plot-centric story that leaves you hanging on every chapter. If you couldn't tell by now, I loved this book. It had everything I look for when reading: a fascinating setting, characters I could care about as well as understand (i.e., there is no stock villain present anywhere in this book), and a plot that was exciting as well as fulfilled by its ending. This novel deserves success and I look forward to what Erin Morgenstern can do to top this feat.